Evanston Fire Station 4 will remain open following the approval of the city’s 2019 operating budget, ensuring service levels and response times will be maintained at the current standard. Aldermen voted 6-3 to approve the city’s 2019 operating budget at a Nov. 19 council meeting, granting the city more than $319 million for the next year. The budget, which seeks to fill a projected $7.4 million deficit, was released at the beginning of October and includes a number of expense reductions and revenue increases. Now, the department will hold some vacancies open and cut parts of its community engagement programming for the next fiscal year. During a Nov. 5 council meeting, aldermen overwhelmingly opposed the possible station closure, referring to increased response times and also pointing out the fact that many residents rely on firefighters for medical care. EFD’s call volume has increased by 51 percent over the past 35 years, and is expected to increase by 2 percent per year moving forward. 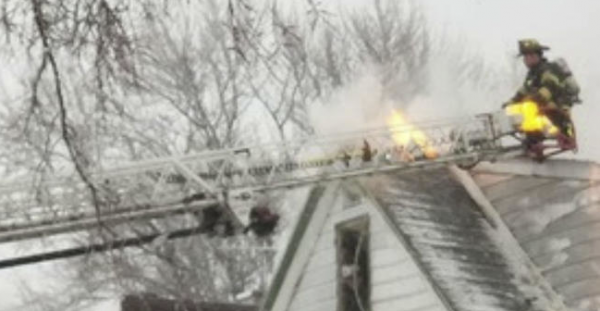 Evanston firefighters responded about 6:49 a.m. Monday to a single-family home in the 1100 block of South Boulevard and found heavy smoke and moderate fire conditions in the front of the building. Firefighters entered the home and put out the fire within 30 minutes. Three firefighters suffered minor injuries. Investigators say the fire was caused by candles used for Christmas decorations. For the past 16 years Evanston Firefighters Association IAFF Local 742 has funded a Thanksgiving charity event to provide all the ingredients for a Thanksgiving dinner for 12 Evanston families in need. On Saturday, volunteers put rolls, boxed stuffing, cranberry sauce, veggies, a turkey, pie, and other edibles in 12 separate plastic containers and dropped them off to Family Focus social service agency in Evanston, which will deliver them to the families before Thanksgiving. The idea for the Thanksgiving charity event started 16 years ago when some firefighters decided to piggyback on another giveaway where they collected toys to give to kids at Christmas. Thanksgiving and Christmas events are about the union and firefighters giving back to the Evanston community they serve. 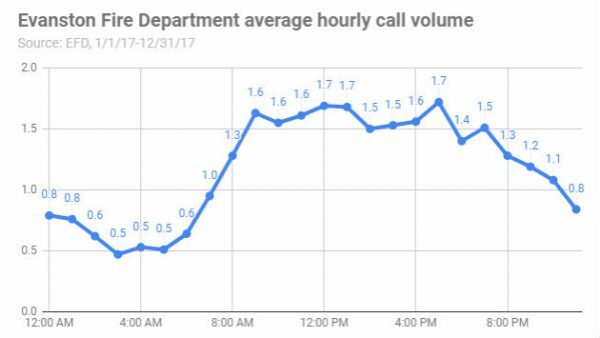 Evanston’s firefighters responded to twice as many calls during the daytime hours than they do at night, but the city’s 24-hour duty schedule for firefighters means staffing doesn’t vary with the predictable shift in demand. While police officers in Evanston work eight-hour shifts, permitting variation in staffing during different day parts, the 24-hour schedule for firefighters precludes that option. That scheduling pattern for the fire service is very common across the country, although a variety of other schedules, including eight and 12 hour shifts and split 10 and 14 hour shifts are also in use. Calls for service data provided by Fire Chief Brian Scott show that the number of calls for Evanston’s five fire engines, two trucks, and two ambulances range from a low of one call every two hours in the pre-dawn darkness to more than one-and-a-half calls per hour at mid-day. Roughly two out of every three calls are ambulance runs.In addition to an ambulance, a fire engine is dispatched for every ambulance call. Some reports have raised questions about the health and safety impact of working 24-hour long shifts. And reports are mixed about which pattern is most efficient from a scheduling and overtimestandpoint. 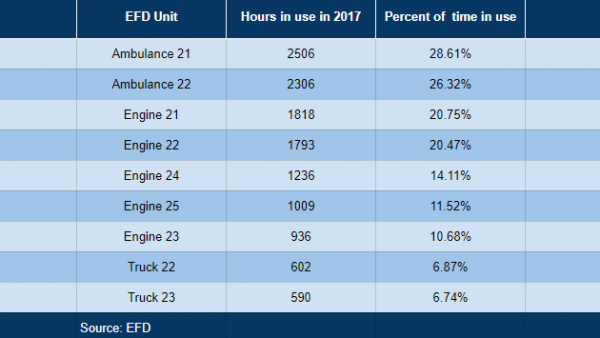 Fire department data shows that Evanston’s ambulances are by far the most heavily used vehicles in the Evanston fire fleet. Ambulance 21 is on calls nearly 29 percent of the time, while Truck 23 is in use less than 7 percent of the time. The Glenview Fire Department has come up with a partial solution to the varying level of demand across different day parts. 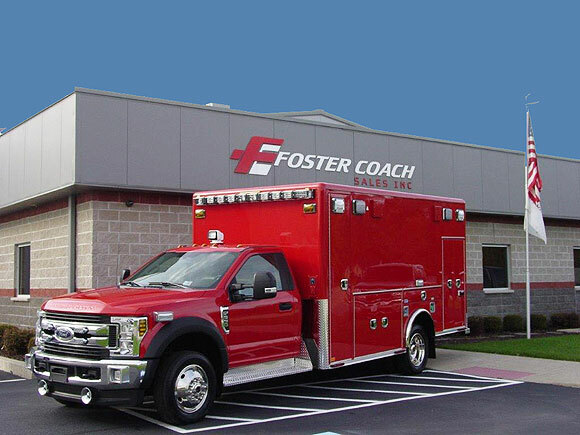 It runs two ambulances 24-hours a day and staffs a third ambulance for 12 hours each day — from 7 a.m. to 7 p.m. Glenview’s department serves a population of about 60,000 people in the village and adjacent unincorporated areas with four engines and one truck in addition to its ambulances. Evanston’s Chief Scott says a third ambulance would help reduce call volume for the existing two ambulances which are extremely busy, but he says given the current budget deficit it would be extremely difficult to fund the addition of even 12 more hours of ambulance service. The city manager has proposed closing Fire Station 4, which would eliminate the jobs of nine firefighters. If instead of closing the station, which now houses an engine, an ambulance operating for 12 hours a day were stationed there, it would make it possible to reduce the impact of the loss of the engine on service levels while still eliminating six of the nine firefighter jobs proposed to be cut. A $1.2 million cut to the Evanston Fire Department in the city’s proposed 2019 budget would mean eliminating nine positions and shutting down Station 4, which has led to pushback from current and former EFD personnel as well as city residents. The suggested reduction is the largest for any city department and follows a 2018 budget cut of $288,762 for EFD. Station 4 — located at 1817 Washington St. — is in the 2nd Ward and services the southwest region of Evanston. The city manager said if city council approves the proposed budget in November, the building that houses Station 4 will be sold and nearby stations will take over for the area. However, in an email to The Daily, Evanston Fire Local 742 union executive board members Ryan Roeder and Billy Lynch said recklessly closing Station 4 would compromise the safety that Evanston residents deserve by causing delays in service. They said the city’s five fire stations are strategically situated to respond to emergencies. According to EFD’s 2017 Annual Report, the department responded to just over 10,000 emergency calls last year. Former EFD Chief Greg Klaiber wrote in an Oct. 7 Facebook post that 1,173 of those calls were located in the neighborhood serviced by Station 4, which is typically staffed by one captain, two firefighter/paramedics, and one fire engine. Evanston and Northwestern are serviced by only two ambulances and seven firefighter/paramedic-staffed vehicles — five engines and two trucks. According to the proposed budget, after Station 4 is shut down, its fire engine will also be removed from service. According to Klaiber, engines located at Madison Street and Emerson Street would have to cover the area, resulting in increased response times. Roeder and Lynch’s joint statement echoed Klaiber’s post, calling the proposed closure particularly concerning because of the already limited resources that EFD has. On top of that, they said the number of EMS calls has more than doubled in recent decades, though there has been no increase in the number of responding personnel. The proposed budget’s decrease of nine EFD positions — one layoff of an active firefighter/paramedic and the elimination of eight vacant spots — would only increase the strain,. The city will hold a public hearing about the budget on Oct. 27, and each ward will be hosting informal budget review sessions through Oct. 24. Residents can also use the city website to comment on the proposal before the final vote in November. In a message posted on his Facebook page, Klaiber says he can’t support elimination of nearly 10 percent of the city’s firefighter/paramedic positions. Klaiber, who since his retirement from the city has worked as director of emergency management at Northwestern University, says that last year about 11 percent of the calls for service in the city came from within Station 4’s protection district. Evanston city officials have proposed cutting nearly 40 jobs — including five police officers and nine firefighters — slashing the public health department budget, closing one recreation center, and closing and selling a fire station in order to deal with a $7.4 million deficit expected in the city’s fiscal year 2019 budget which runs Jan. 1 to Dec. 31. The discussion comes as Evanston deals with decreasing property tax revenue, increasing employee and pension costs, anticipated bond debt to pay for capital improvements around town, and costs to rebuild the Robert Crown Community Center, among other factors. The reserve fund, which ideally should have 16.6 percent of the city’s annual operating expenses, ended 2017 at 12.8 percent. As such, $1.5 million of Evanston’s operating budget is marked for contribution to general fund reserve. The city has marked $1 million for debt service to pay for renovations to the Robert Crown Community Center. City officials say property tax revenue has not recovered since the recession and sales taxes since that time have stayed relatively flat. Meanwhile, building permit revenue has dropped from a 2016 high and is not expected to recover soon. The city proposed eliminating 38.5 jobs. Of those, 21 are vacant and 17.5 are filled. Positions that could be cut include: cultural arts coordinator, legal analyst and liquor licensing manager, facilities maintenance worker, fleet operations coordinator, payroll/pension specialist, junior mechanic, two full-time and one part-time human services advocates, the director and assistant director of public health, communicable disease specialist, one police commander, one court liaison, one police video records specialist, five police officers, nine firefighters, and two public works maintenance workers. Another proposal reorganizes the parks department, which could result in one full-time and three part-time positions being cut. Fire Station 4, in the 2nd Ward, could be closed and put up for sale, with all firefighter positions there eliminated, according to the proposed budget. That could save the city about $1.3 million. In contrast, the city could close the Gibbs-Morrison Center in the 5th Ward, but keep the building and property and lease it out to a new operator. City staff also is proposing eliminating the Storefront Modernization Program, which includes grants to help local businesses update entryways. Cutting that program would save Evanston $75,000. Also on the cutting block is Evanston’s Cultural Arts Administration, which helps support local arts. If cut, it could save the city $175,000. Staff also proposed eliminating the annual World Art and Music Festival, which would save $55,000. Also proposed is reducing Mental Health Board funding by $250,000, or about 34 percent of the 2018 budget. Some proposals to help generate additional revenue, staff has proposed increasing the residential parking permit rate from $15 to $30, raising parking ticket fees from $20 to $25, charging $70 for block party permits — which now are free, increasing the wheel tax from $75 to $85 and contracting out the city’s crossing guards. The council is expected to begin discussing the budget at its Oct. 22 meeting and hold a public hearing on Oct. 27.